This week we made our Nannies and loved ones doorstops. I know you’re jealous and wished you had one too…why don’t you make your own! All you need are some rocks and some paint and if you are really organised (unlike me) some varnish would be delightful (PVA glue would also do the job). 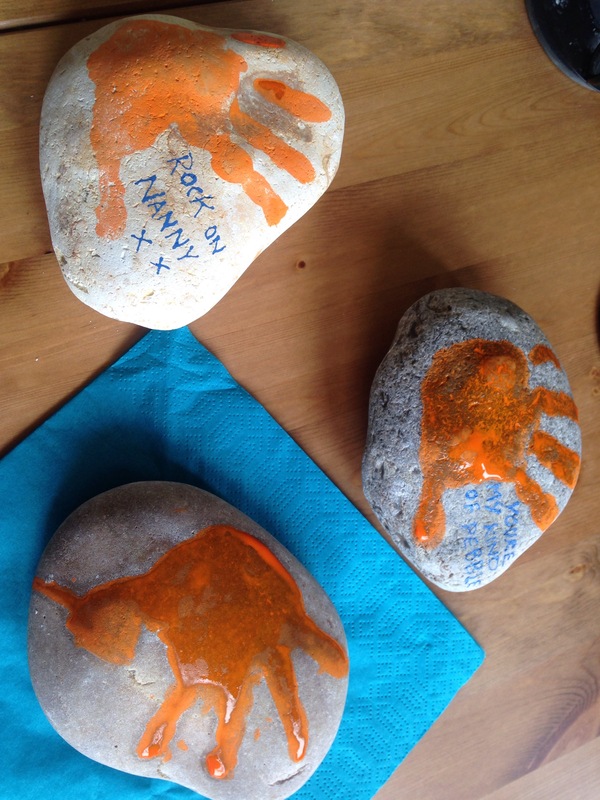 J got to grips with popping his hands in the paint and splaying them with toddler zest over the rocks. The sensory ‘bit’ came from getting his hands in the paint. He really enjoyed playing with the paint and I finished them off with personalised comments such as ‘rock on Nanny’ and ‘you’re my kind of pebble’. It would be lovely if he could of written it, but at 2 years old I have to stay realistic. The rock / pebble that is on the blue napkin was our disaster. It was too smoothe to absorb the paint and ran like a spray tan in the rain – not ideal. Like I mentioned, a little varnish would finish these off but we were too busy playing with the squidgy paint. Give it try and let me know how you got on.